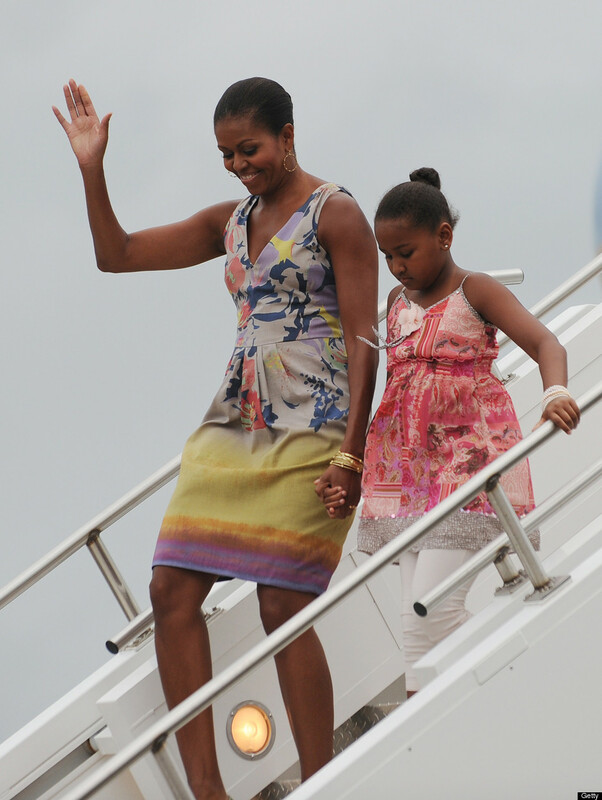 Michelle Obama (Barack Obama's wife) became known as the first African-American 'First Lady' in the US. Notice her extra heart line... ... or, is it a head line? And see the extra-line on the middle phalange of her ring finger! 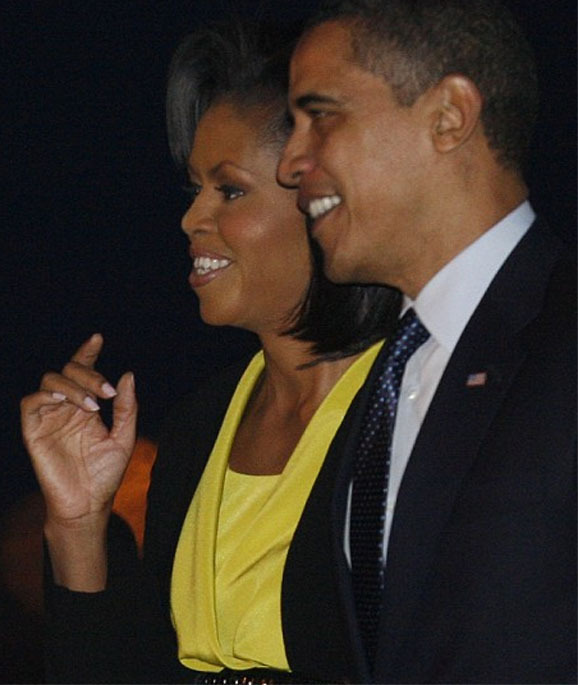 I was hoping we would get some comments on Michelle Obama's hand. I would like to hear opinions on what the line is under the heart line. Is it second heart line or head line ? - For, the 1st photo appears to indicate that the line has a slight 'down curve'. - And the 2nd photo of her left hand shows a 'splitting head line': and I recognize some similarities between the upper splitting with the strange line in her right hand. I agree the second line is more related to the head line, had though of the possibility of a Sydney line... but the lower head line more closely reflects the inner self or left hand and the focus on primary goals, where as the dominant head line that ends more on the Mount of Jupiter reflects the persona we may see more of in public.... pragmatic, independent, strong sense of what she wants to achieve and the need for it to reflect her religious philosophy. This seems to be backed up with her fingers and the curving of the first and second fingers which would suggest both a strong religious background and a need to achieve her ideals. In particular the long first phalanges on the index finger and middle finger. The offset Mercury for me indicates that she acts from personal conviction not social dictates. The thumb curving in, if there isn't a physiological reason for it's inward curve reflects a possible grasping personality. Thanks for sharing your analysis!! Regarding the option that the second head line might be a Sydney line, I would like to notice that in the picture below you can see that it clearly doesn't reach out to the side of the palm. So, I think it can be described as a long head line... but it should better not be described as a 'Sydney line'. By the way, in my analysis I mentioned a 'short pinky finger' - but I think your analysis does includes an interesting specification: the impression might also be the result of a low set pinky finger. EDIT: A few months ago I developed a new method for measuring the length of the pinky finger in the perspective of the full hand length. And applying that method to her pinky finger, results in all photos that I have seen so far in this discussion that the length of her right hand pinky finger can be described as 'short'. 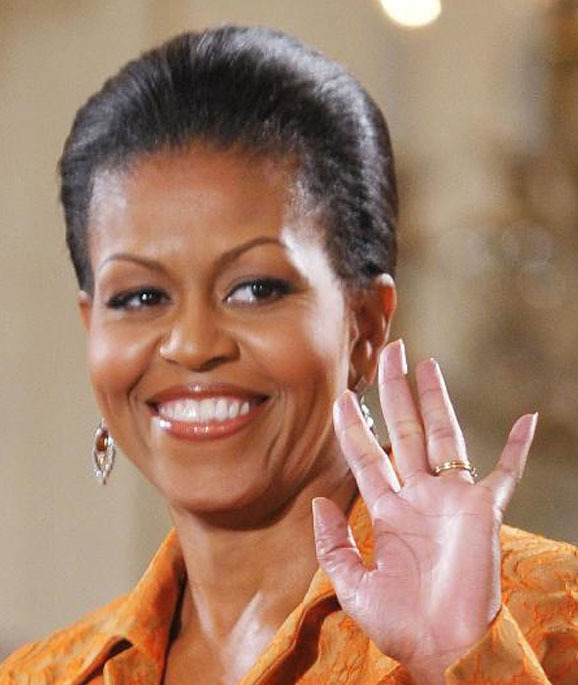 So, likely there Michelle's right hand displays a combination of a short pinky finger + a low set pinky finger... resulting in the impression that her pinky finger doesn't look very strong. Thank you so much for your wonderful articles, which I have often read and referred your site to others. Relating to the little finger, in the earlier time called the auricular finger funnily enough, I usually take the finger length from the knuckle to the tip and have found that a low set finger often seems to relate to those with a fear of financial insecurity and sometimes parental breakup in childhood. Off set has often been seen in individuals who act outside the square... I have also noticed that it gives a great insight into a persons character, consistent with observations from old schools... and strongly related to communication skills. I have found also, a high correlation with old school observations of the Mercury finger nail- when narrow in relation to the finger, long and the women being highly aquisitive and manipulative. I long have noticed a high correlation in people with Asperger's - not that I get the opportunity to see a huge number and irregularities in the Mercury finger... this sometimes also seems, in Asperger's, where there is high function, to relate also to the heart line. One case, where the girl was highly intelligent and unfortunately relegated to classes with Down Syndrome etc and known for violent outbursts- perfectly understandable when you knew her circumstances, the heart line travelled down inside the head and life line. I pointed this out to her and also acknowledged the most unfortunate circumstances she found herself in, whereupon she opened up and we had the most incredible conversation! 12 going on 85 years!!!! A girl with Down's Syndrome and a highly developed Mount of Luna, or sub thenar mount, but with a long ring finger, was delighted when I asked her about whether she loved art and had a very active dream life, and once again I was blown away by the depth and complexity of her aspirations and dream life. By the way, I would love to hear more about your ideas about Asperger's syndrome. And where you able to make a handprint? I have a similar palm with an extra line that could be considered a parallel heart, head, fate, or life line- since it forms an intersection to all of them. I've been studying palmistry for years, but haven't found anyone with an extra line like mine. This does not surprise me on her. Mine is also on the right hand (and a little different- as I have a darker mystic cross in the middle of all of it). This has renewed my interest in palmistry. Nice to hear you thoughts about Michelle's palm. JenniferM wrote: I have a similar palm with an extra line that could be considered a parallel heart, head, fate, or life line- since it forms an intersection to all of them. Could you send pictures of your hands. 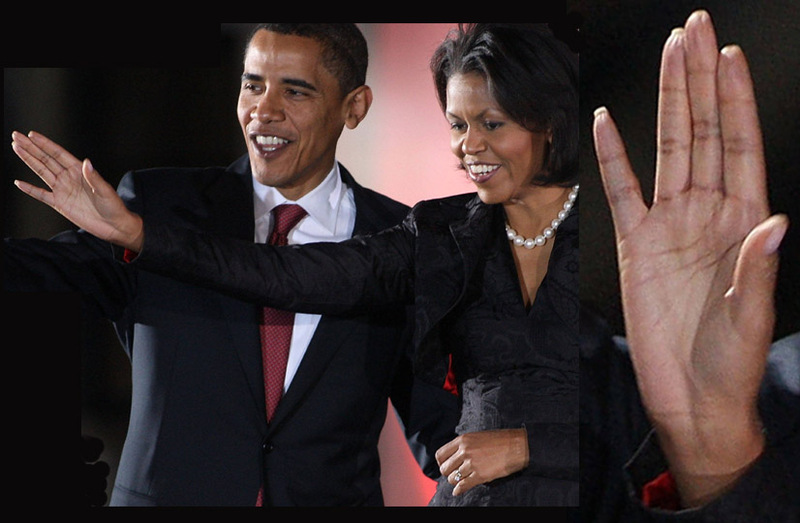 I have been looking and looking at Michelle Obama's hand and I am puzzled. I do not think the pictures are clear enough. I read the link Martijing gave us and that reader definitely believes it to be two headlines, so I think she must have clearer pictures. What we are looking at is not clear enough to verify this. To say what she says she must be able to see that line coming from Jupiter and all I see is a line above the headline and also is that line coming in from the percussion side and therefore hovering above the definite headline. If that line comes in from the percussion that has a very different interpretation. Hope you will send pictures of your hands. Thanks. Here is my hand. It is not easy to get a great photo, since it is very water-type, with many lines. My extra line is connected by a very deep mystic cross. The bottom runs parallel to the life line and the the top curves up parallel to the heart line. It really made my day to see another hand like that. I have read dozens of palmistry books that do not touch on the subject. Alcoholism within the ancestors, if on the right, on fathers side. I would add: Specially if the lower is slooping very down to the Moon. Here in your hand I would count on unconscoius darker moods sometimes with a lighter, more realistic way of thinking, getting stronger specially after around the 40th birthday. Probably with a preperance beginning at around the middle of the 30ies. The consequences of the alcoholism may include several different meanings: Doubble personality in any kind nd more. Would you like to put in a better foto? In MO foto I would count the Mercury as the dominan finger and qualities. I have a deceased biological father and a step- father whom I was raised with. I've not seen either of them drink alcohol. I do know of one person who might have suffered from alcoholism on my biological fathers side, but she had been struck by a tragedy. I'm not fully convinced that my line is an extra head line. There is a darker X between the lines, and to me this implies it might actually be an extra heart line. Or something in- between. As for double personality, anything is possible, but no clinical diagnosis of such has been made. It sounds like from what you are saying, I might be better off emotionally as I head toward my forties? I don't really have a palm/ person to compare it to. This is the closest one I have found, and there are several differences. My palm is a little more water type than Michelle Obama's, so it can be difficult to get a good photo. I once had a good ink print. I'll put one up ASAP. It's nice to see another unusual line here. I posted photos of my hand in my other post where I have an extra line on left but not on right. It's hard for me to find the origin of that line and to describe it with an appropriate name. You can find the link here. Some said that it's a second heart line and others say it's an extension of head because it seems to meet with upper branch of forked head line. Hope it would be interesting for everyone. Thanks for the link. Very interesting. Are you left or right handed? My double line is on the right hand but I am left handed (although sort of ambidextrous). Reminds me of a brilliant mind at work; wonderfully healthy elasticity! A healthy bent of fingers showing a healthy shrewdness at work; socially conscious. The left hand is growing from bottom upwards gracefully, showing the conic beauty in a spatulate form..... very productive, yet beautiful inner nature.. very graceful. The mercury finger is outstanding, though low set, has individuality, showing graceful disposition to independant action. Such mercury denote that the native is not pulled down by negative, restrictive circumstances of the early ages, but get strength/courage to climb out from the them to achieve a life of healthy independance/freedom; but need a platform/support for that. The right hand mercury finger is unchanged in its independance; but yet the pulled inwards thumb show the need for support. Such people are very innovative; but need a strong support/shoulder to grow materially/career wise. I guess this would be her husband in this case. Such hands betray the spouse is signified by moon, a motherly soft natured person, fond of the arts. Her career would be brilliant and would attract money. Such people are wisely attached to sucess in fair ways. Around age 26 (hand not properly, so It could be off by a year) to age 33 she could make strong efforts to affect some positive changes in her self (26); which she did during the abovementioned years. From age 33 she was ready to perform and go outwards. Her wishes to transfer ideas to her spouse is strongly indicative. A very positive mind. From age 48 (2012) she would be come out of her structured routine to concentrate in newer areas; maybe something she/they wanted to pursue. What does that extra-line on the middle phalange of her ring finger indicate?? I have seen a similar mark on one of my friend's palm. Also what does those lines indicate if they are present on each of the other 4 fingers.